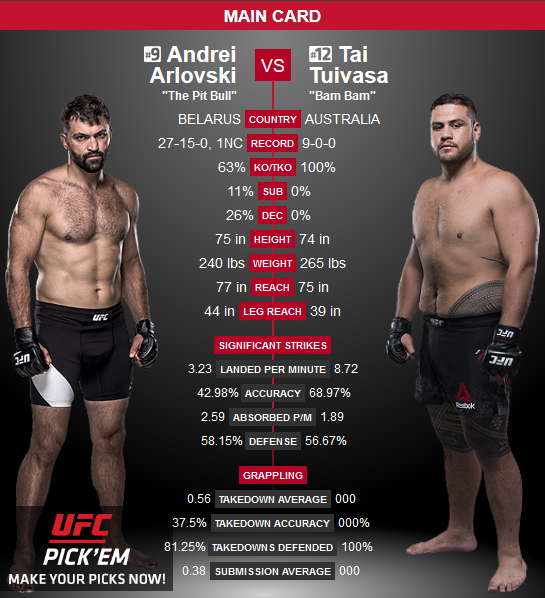 MMA fans are in for a treat as UFC 224 is set to go down Saturday, May 12th, from the Jeunesse Arena in Rio de Janeiro. Top billing on the card is the women's bantamweight title fight featuring champion Amanda Nunes facing Raquel Pennington. Also fighting will be Kelvin Gastelum vs Ronaldo Souza and Vitor Belfort facing Lyoto Machida. UFC 224's main event will feature women's bantamweight champion Amanda Nunes defending her strap against good friend and top contender Raquel Pennington (+375). Nunes captured the bantamweight title with a first-round submission win over Miesha Tate. In her first defense of the belt, Nunes earned a 48-second TKO win over Rousey. Her most recent defense was a five-round split decision victory over Valentina Shevchenko in September. This will be Nunes' first fight since September 2017. Another title defense will put her in line for a shot at featherweight champion Cris Cyborg. Nunes last loss was a third-round TKO defeat to Cat Zingano in September 2014. Does underdog challenger Pennington have a shot at beating the champ? She is on a four-fight win streak with victories over Jessica Andrade, Bethe Correia and Miesha Tate. Pennigton's last defeat came at the hands of Holly Holm. That bout took place in February 2015. Two fights after defeating Pennington, Holm captured the bantamweight title with a knockout win over Ronda Rousey. 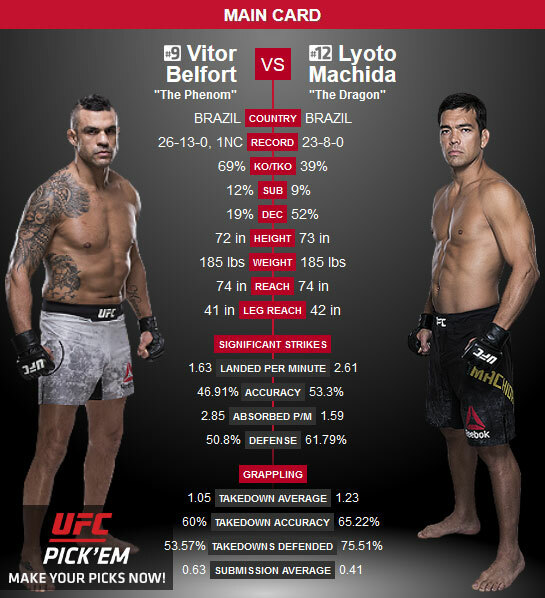 A middleweight fight between Brazilian legends Vitor Belfort and Lyoto Machida will be a great treat for the home crowd in Rio. Belfort, 40, is coming off a decision win over Nate Marquardt last June and before that he had KO'd in four of his last five fights. "May 12, [Machida] and I will step into the Octagon as professionals and we (sic) still be friends," Belfort wrote after announcing the fight on Instagram. "Always respecting each other, and the way we will do that is giving our best in the Octagon." Machida, 39, earned a split decision win against Eryk Anders earlier this month after an 18-month drug suspension. A bout between top-five middleweight contenders Ronaldo “Jacare” Souza and Kelvin Gastelum might be the fight everyone talks about the morning after. Souza KO'd Derek Brunson in January and the Brazilian is the No. 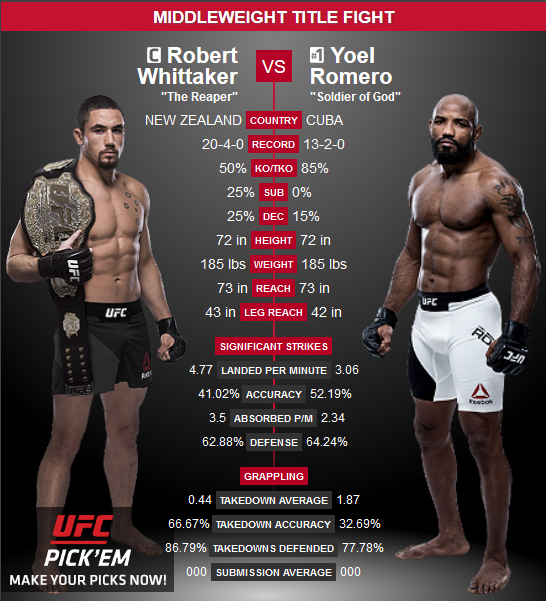 2-ranked 185-pound contender in the UFC. Gastelum's last bout ended former champion Michael Bisping losing consciousness. The 26-year-old is ranked fifth in his weight-class. Amanda Nunes dismantles Raquel Pennington to retain title. Amanda Nunes is once again the most dominant force going at 135 pounds. "The Lioness" put on a clinic on Saturday night when she faced off with friend Raquel Pennington in the main event of UFC 224 from Brazil, dominating Rocky throughout the first four rounds of a hard-fought battle. Nunes was the more accurate and active striker in the fight, landing 149-of-300 punches thrown to Pennington's 79 of 210. Nunes appeared to hurt Pennington badly in the fourth round when she busted up her nose to the point that blood started spilling out. When Pennington went to her corner after the round, she told her coaches she was done, but her coaches told her to keep going. Kelvin Gastelum earns split decision in wild battle with Ronaldo Souza. Ronaldo “Jacare” Souza’s world class jiu-jitsu held sway in the opening round. Kelvin Gastelum roared back with a killer performance in the second. The third round was a wild, back-and-forth affair. It was going to come down to a coin flip of a judges’ call, and in this case, Gastelum got the nod. 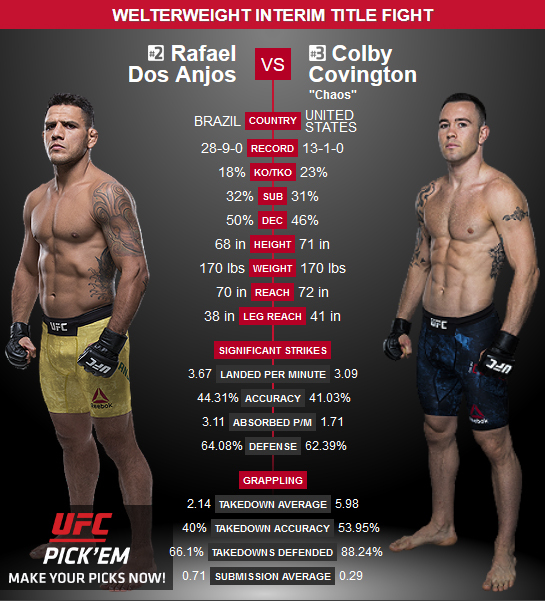 The TUF 17 winner heads home to Arizona the winner after a thrilling UFC 224 co-feature bout in Rio de Janeiro. Gastelum got the better end of two out of three 29-28 scorecards to earn the split decision. Souza, an eight-time World Jiu-Jitsu Championships gold medalist, demonstrated why by putting on an absolute clinic in the opening round. 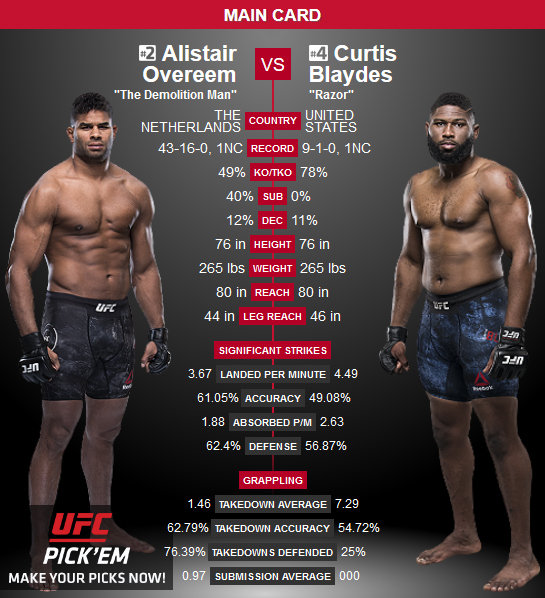 He finished through on a single to score a takedown, slowly improved his position, and has Gastelum cranked in an armbar when the round expired. Mackenzie Dern submits Amanda Cooper. Mackenzie Dern had a bad Friday, but she sure didn’t have any problems on Saturday. Dern missed weight by seven pounds for a planned strawweight bout with Amanda Cooper at UFC 224 in Rio de Janeiro, Brazil. And while Cooper ripped Dern for her unprofessionalism after the bad weight miss, there’s no denying Dern got the job done when the duo stepped into the cage. A wicked overhand right set up the finish, as choked out Cooper at the 2:27 mark of the opening round. “I’m very happy to have the victory, the submission and kind of knockout,” Dern (7-0) said.